Friends, I’m so sorry that I missed Day of Giving Friday last week — the will was there but the way was missing. As I was writing my post last Friday, my house was stuck by lightning – a first for me, but something I’ll never forget. I didn’t realize it at first but there was so much damage; the first clue was when the power company with a bucket truck showed up at my door and I had not called them. They said they that lightning had fried my electricity meter and they were there to put on a new one. It dawned on me how lucky we were to be alive; that neither of us had been on the phone or that we hadn’t been outside during the lull in the rain! The lightning fried all my televisions, all the internet equipment and killed the air conditioning/heat system. I’m juggling vendors to make repairs in between calls to the insurance company. Mom and I gave up trying to brave the Florida heat inside and through pure kindness, found haven at a little hotel where they found a way to squeeze us in and even gave me a first floor room since I’m on crutches. I’m lucky….things will get back to normal but I’m reminded how horrible it must be for people who are displaced by weather or circumstances. I’m sitting cozy this morning, blessed to be able to write my post in a cool room, and it looks like after a week of flooding (like I’ve never seen) today we might see the sun! I have not been able to craft in the last week but pulled one of my favorite cards from the stash. Today I’ll skip the how to’s but as always with Day of Giving Friday I want to send this out to one of you. 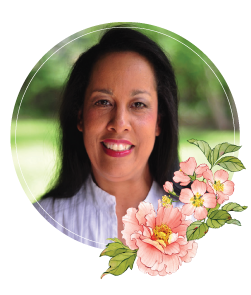 I love sharing my cards and hope if it comes to your door you’ll flip it over, turn it upside down, scrutinize ever detail and realize that yes, you can make this too! For new readers, every Friday it’s my pleasure to give away a card. The card goes to a randomly picked reader (worldwide) who leaves a comment in our conversation. One comment is randomly picked and the winners name is posted HERE. If you win, simply send me your address through my comment form and I’ll send the card to you. Want to know more about Day of Giving, here’s a link to my FAQ’s just check out #11. I believe that everything happens for a reason and while on the surface some things may not ‘appear’ to be good……..deep down, there’s always a blessing in disguise. For me, the break neck speed of living, noise, deadlines and so many ‘have-to-do’s’ sometimes keep me from sorting out the black and white that’s often standing right in front of me. This week removal of the internet, news and ‘the ability to be busy with busy work’ brought an unexpected peace and clarity – it was my blessing in disguise. How about you? For your comment, what has been your blessing in disguise this week? ****Note, many of you ask which paper I use for my cards and I have linked it up above to Amazon however, absurdly, the picture they show is a generic photo they use to represent every paper. I have ordered from this link and can confirm that what I received was Neenah Classic Crest – Natural White – cover – 80lb smooth – 250 sheets. OMGoodness I miss you all! No worries, I’m doing good. My foot is healing nicely and with luck I’ll have some good crafting time soon! Oh my goodness Becca! Thank God you are all ok. That is so scary! I hope everything gets repaired quickly and you get to go home soon. My blessing is not in disguise but every time I look at my children, I realize what a blessing they are. Amazing card! Would love to receive this stunning work of art from you and proudly display it in my craft room! I’ve been out of the loop a bit so didn’t know about your foot and now this mess Becca! Bless you. You always seem to make the best of things. My “blessing” is reading your post. I’ve been down in the dumps, having a pity me week. After reading your post, I’m bound and determined to get motivated. OMGosh!!!! Becca!!!! So glad you and your mom are not hurt and will send up prayers for a quick resolution to your housing needs/repairs/etc! Hope your insurance company doesn’t look at the lightning strike as an ‘act of God’ and refuse your insurance claim like some companies might. What a horrible thing to happen while dealing with your foot. Will be praying for you! Hi Becca, glad that you both are alright and your foot is healing nicely. could you send some of your rain my way as things are so dry, my lawn looks like crispy crunch, keep showing rain and we get none, but all around. I am so pleased you and your Mun are safe Becca, i am a big believer that we have to have the bad times to really appreciate the good. I am blessed to have a lovely Son who is fighting Cancer he has had so many hics and set backs but he is much stronger than all of us and determined he will beat this ,he will hopefully start the treatment soon . and your family are going ! you were having a rest with your foot !!! would have been so frightened . Oh my gosh Becca, how terrible this is for you, but like you said, good that noone was hurt in any way, then the rest will get sorted eventually. We tryed this many many years ago, shortly after we had bought our current place, and was without any power for about 4 weeks over the christmas and winter here, so we had a christmas in candlelight that year, and the kids found it pretty exiting, because they thanks god, didn´t understand the serious part of it back then, but I agree with you, not anything I´ll like to try again ever either, that´s for sure. But don´t feel bad at all about the card, I´m sure we´ll all survive that part. It was love at first sight, I have made this card in so many ways with so many materials and I’m still in love with it. You have such wonderful style and taste. Thank you Becca, I’m truly grateful for all that you share. Thank Almighty that both of you are ok… wish you the best luck for a speedy normalcy back to your creative journey! Oh my gosh, Becca. Thank God you and your mother are ok. You are in my prays. Hope everything gets back to normal for you soon. Remember that God tells us he will never put more on us then we can handle. Oh, Becca. God is so good, isn’t He! I am so thankful you and your mama are ok. I wish I lived there so you both could come stay at my house while your place is being repaired. But I am thankful you have found a cool comfortable temporary home-away-from-home. You’re in my prayers! Thanking the Lord you are alright. Stuff can be replaced, but you are not! Happy you had some rest away from all the daily pressures which can truly take over our lives without us realizing it – we have all experienced it! Silly as it may sound, I have forced myself to come out of my studio and sit with my husband while he sleeps (on Hospice), and just quietly read a book – this blessing in disguise has brought companionship as he awakes for a few minutes, and peace to my heart. Oh my goodness I am so glad you and your mom are safe!! Wow!! I’m so sorry Becca to hear what happened, but oh so glad you and your mom are okay. What would we do without your beautiful work. Praying everything is back to normal for you real soon. OH Dear Becca, lightning? First of all, my mouth made a loud WOW when I saw this card. So fine! I love fussy cutting flowers. My Blessing in disguise is similar to yours. Our home was struck by lightning as well. When the firemen were through cleaning up the mess we looked at our Insurance Policy and, because we had moved from out of state we left the details to our Realtor whose brother owned an Insurance Company and had written a Policy with everything imaginable in it. So we were 3 months out of our home while it was repaired, repainted, new wood floors and new counter top in the kitchen. Plus new everything appliances. The lightning had hit the meter and traveled up the wiring into the duct work and spewed fire and soot on everything. However, BID again, we had just moved in and most of our belongings were still in boxes. God is good! When I read our post today, I was saddened of the news, but so glad God spared you and Mother from the devastation which could have been. We never know the kindness of God until things occur,and realize it could have been worse. Sorry I have not been following any post and was so surprised to hear of crutches. Whatever caused it God and heal it wit time and patience. Should you need anything, drop a msg. and I will will respond. I had sent you an email a couple hours ago as I was worried about you! When a week goes by without anything on “Amazing Paper Graces” blog, I get concerned. So sorry to hear of the misfortune but happy no one was injured and that maybe it was God’s way of making sure that you were taking it easy!! Today’s card is truly beautiful and I would love to have it in my collection of your card collection. I have 2. Hi Becca, So glad you and your Mom are safe. And hope soon you will be back to normal. Beautiful card I love all your creations. Becca so sorry to hear about your challenges these past couple weeks. I just figured you were off on a vacation somewhere. I looked for your inspiration last Friday and did not see anything I’ll admit i was a little sad. But now knowing what you guys have been thru I’m so happy you all are alright. I don’t really have any blessings in disguise because I try to turn every situation into a blessing because I believe All things are in Divine Order according to HIS will. I am eternally grateful. Becca, I was just beginning to worry about what was happening with you when I saw this email. I am thrilled you are improving and Mom is there with you and you are both safe and sound. I am happy your insurance is doing their part to correct the problems of Mother Nature. Hi Becca, How lucky have you been !! God was certainly looking over you, thankfully. 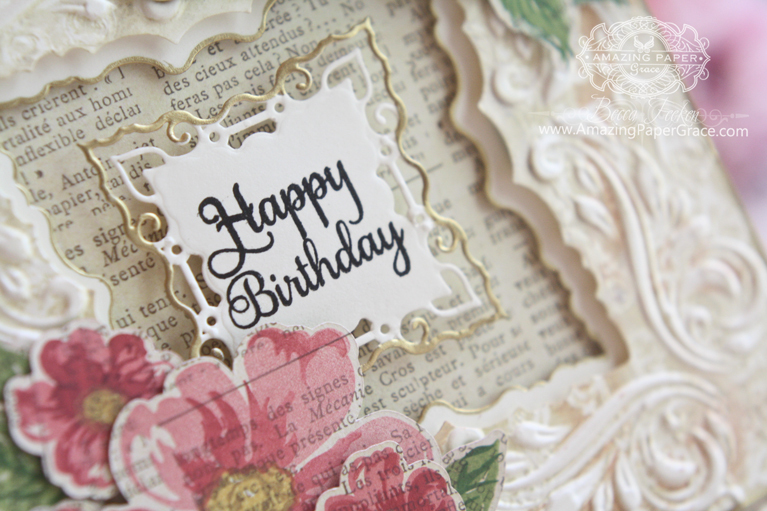 This card is stunning, the embossed pattern is stunning, I love it !! I have had an awful week, no blessings in disguise sadly, apart from, of course, the fact that I have woken up each day which is definitely a blessing to me haha. Since January I have been working on my crafts to enter in the county fair that I have been doing for many years. I just had knee surgery and not back on my feet. The line to enter has always been very long and the summer heat is very bad. Since I worked so hard on my entries and no matter what I was going to enter them. I worried about the long line and uneven ground but when I got there, there was only 2 people in line. This was a first and a real blessing. So sorry to hear about your troubles. Hope things run smoothly for you and not cost $$$ to get back in shape. Nice that you found the good side. Beautiful Card Becca. So glad you were unharmed. God is good. Stuff can be replaced but not lives. I’ve been away for awhile and I’m so sorry to hear about the huge challenges you’ve been presented with. Blessings on you and your Mom. I’m glad you’re o.k. and in some comfort. I would love to send you a card, but I don’t have your address….then again, perhaps you don’t have access to your normal postal deliveries! I am so relieved to hear that you are okay. It’s just like you to find the blessing in this situation. No wonder we love you so much! I had a bad allergy day this week which found me giving myself a little TLC. Because of that, I was home when FedEx tried for the 3rd time to make an important delivery. That certainly saved me some wear and tear. What beautiful detailing to today’s card. I just love the embossing and the exquisite cuts of the frames and tags. I am so sorry to hear of your episode with the lighting striking your house. That must be so awful but so glad you were not injured. Lighting is very scary and dangerous. Love your site and your beautiful cards. So inspirational to attempt to make. Hope things are back to normal soon. Oh Becca so blessed to know you and your Mother are safe – what a week!! 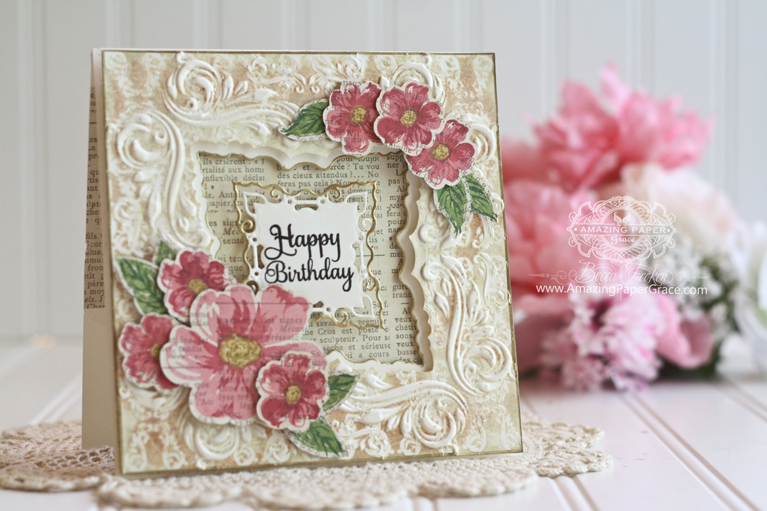 Your card is beautiful – love the the slightly stronger colour on the flowers. Our blessings in disguise this week has been bad news of a loved one’s health. It has sent me to my knees, and given me yet again a deeper appreciation of the precious-ness and fragility of life. Oh Becca, what a terrible time you’ve had, but so glad that you and your Mum are ok. Hope you get things sorted at home soon. I have seen a family get torn apart recently in such a terrible way. My blessing probably not in desguise, but it has made me apreciate everything my husband does for me even more & realise the dramas with my teenagers are just tittle problems compared to what others are going through in todays world. I try to focus more on the positives rather than the negatives. Sometimes we all have a terrible thing happen around us that makes us stop & see the world through different eyes. I’ll be discreet and just say that my blessing in disguise was an opportunity to show grace. OMGoodness! What a scary thing – so glad the two of you are ok, and cozy, etc. But still….wow! Trying to see the third rear end accident (I was rear ended) in five years as a blessing in disguise…it will probably come, but not quite yet. Nice card today, btw….and I’m glad your foot is still healing well. Absolutely beautiful! Need I say more? Good morning Becca, I wondered why you didn’t post last week!!! Thank goodness you’re both okay, the inconvenience is a pain but it could have been worse be thankful for small mercies!!! Your card would cheer anyone up!!! What a scary experience, Becca, I’m glad to hear that you didn’t get hurt. Your card this time is absolutely gorgeous! Hi Becca how frightening for you that must have been !!!! Glad alls well in the end though….what a sweet card today ..as always!I am so thankful we didnt get flooded here like they did in Cumbria during last winter i cant think of anything sooo awful its not just water but sewage too YUK . Hope all is well for you after your foot surgery and you are enjoying having your mum to stay . So glad to see you back! Missed you and was beginning to worry. So very sorry to hear about your lightning experience. We all know it could have been worse (total destruction). Many lightning strikes start fires. The fact that did not occur is truly a blessing, blatant and not in disguise. The fact that you and Mom could afford to go elsewhere to stay, another blatant blessing. Just being awakened through grace every morning is a blessing I thank God for every day! As most of my blessings are blatant to me, I can not think of one in disguise that occurred this week. The card is a STUNNER! Well worth the wait. 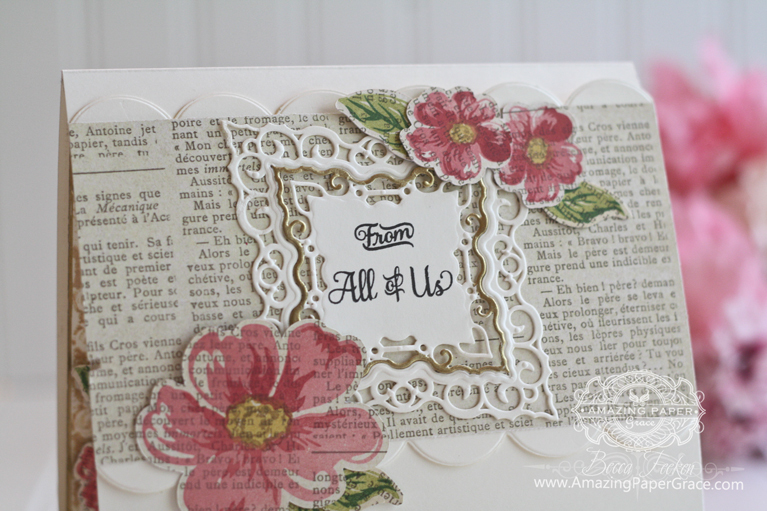 Love the embossing, the patterned papers, the fussy cutting, and the over all design. You are such a WONDER! Speaking of fussy cutting, what was the source of the flowers? They are a lovely representation. I am so sorry that your house was hit by lighting. Could I ask why are you on crutches? but I would like to tell you my blessing. My nephew is back from overseas finally. He is in the Air Force & was supposed to come back 6 months ago. Now he & his family are beaning moved to Guam for 3 years. I am glad it is a safer place than the middle east. Wow, I am so sorry your house was struck by lightening and you had so much damage. Thank the Lord neither of you were hurt and that you found a place to stay. I love all of your gorgeous creations and this is no exception. Becca I am so sorry to hear of the lightening strike and damage to your home. Having guest (your mom) and not being able to be at home is the absolute pits:-(. The blessing is your home didn’t catch on fire!!!! Thank God!!!!! Out of tragedy has come your blessing and ours. Our (your fans) blessing is we still have you. The card is lovely as usual. Oh my goodness, Becca! So glad to hear that you and your Mum didn’t suffer any injuries, but so sorry to hear of all the damage to your home and the inconvenience caused by the lightning strike! So glad you are now in a cool room and that your foot is healing. I do hope that it won’t be long before everything is sorted and you can move back home. Another beautiful card! You are so gifted! My heavens Becca, what an experience and how scary!!!!!! I am so thankful that you and your Mom were not hurt. It is better to have discovered damage in hind sight as you experienced. It sounds as though it could have been so much worse. Sending thoughts and prayers. Hopefully your insurance will do a thorough check on your entire electrical system and your home will have a clean bill of health before you know it. So sorry you had to go through this. Thanks for letting us know. I was really getting worried. Hope your foot is healing nicely as well. Take care sweet Becca and keep us posted as you can. Give Mom an extra hug, for being such a trouper. Oh my! I’m so sorry to hear about lightning striking your home! What a terrible thing to have happen and I know the hassle you are going through dealing with insurance since I was a licensed insurance agent for 20 years. I pray everything goes much better than you could anticipate and that you find hidden blessings in many many things as you travel this road. I received an unexpected blessing from my hubby this week. My family is giving a joint birthday party for my Mom (turning 85) and her sister (turning 80) so I’ve been making 125 invitations, including the envelopes. I needed to emboss 125 she’s of cards to clean that are 6×12″. My wonderful hubby has been recovering from open heart surgery that he had multiple complications with. Instead of 5 days in the hospital, he spent 12! Although his recovery has been slow and he now ha Pericarditis, he volunteered to do all the embossing for me! Since he’s stronger than I am, cranking the handle on the die cutting machine was much easier and faster for him. I’m sorry he’s had to go through the operation but I was blessed because he was here , available and willing to help me out. He’s always an amazing husband but he scored lots of extra points this week! I am blessed! I love your card and the layers and texture it has. It is fabulous so, as usual, I’m crossing my fingers! Gorgeous creation hun, love every detail. Glad your foot is on the mend. What a beautiful card Becca. So glad to hear you and your mom are okay. Repairs to house and contents will take time. I am glad to hear you and your mom are ok and weren’t injured. Things can always be replaced, but not loved ones. I was a late bloomer parent so I count every day that I spend with my two children as my ‘blessings in disguise’. OH flower how lucky you and your Mum is when what could have been so much worse. We have had that lightening across here in Scotland over the past couple of weeks and it is so frightening. I hope that your wee Mum has got over the ramivacations of it and yes bless your lucky stars that you are both safe and sound. Another way of thinking on it is that you both perhaps needed some time away that is both gentle and kind on you with no distractions of deadlines to meet or what “must” be done as this just shows that nothing is more important than being safe and sound. Your card is bonnie flower both in design and in the papers that you have used giving it that shabby chic look that is all around but in a more clean and elegent way( i don’t do roughed up card or torn card, the part of the brain that can allow that is very much over ruled by the neat, tidy and precise part). I hope that you get back into your home soon and it is back to normal. My blessing is having beautiful friends that know when i need that bit of a perk up because things have just went and piled on top of each other. MY lovely friends are coming down on Monday to have lunch out with me which they don’t skirt around the problem, they hit it head on and deal with it and give me a lighter heart. Every time I see your cards I get emotional. I feel so glad that God saved you. I’m so sorry that you had to go through this very trying time. You are one the best card designer in America and you give us all such beauty and joy. May God bless you with everything you need.